Each fielder’s role and positioning on double cuts and relay plays. Includes diagrams for baseball positioning in various situations. If you haven’t already, you may want to read about the basics of cut-offs and relays before proceeding with this article on positioning for double cuts. What is a Double Cut? Double cuts in baseball are needed when a ball is hit to the wall and there is going to be a long throw to a base. A double cut is when two infielders go out to cut the ball and relay (throw) the ball to a base. One infielder will be the primary cut off man, or the lead cut off man. The other infielder will be behind him in line with the target about 20 to 30 feet and will be the relief valve and get the throws that the lead guy can’t handle. This section will show you the ins and outs of where to position yourself. When a double is hit (i.e. the ball gets past the outfielder) and there is a runner on first base, then the throw will be to home plate. As always,there is the potential for a cut-off and throw to 3rd base. If there is a runner on 1st and a ball is hit down the left field line, then the throw is lined up to home plate. Positioning – The shortstop is the lead cut-off guy and the second baseman is the trail man. Stay in fair territory, and line up about halfway between the leftfielder and the catcher. Depth fully depends on the leftfield arm strength. If the ball in hit through the left center gap – runner on 1st – then the shortstop is the lead relay and the second baseman is the trail guy in the double cut lining up to home plate. For a double hit through the right center gap, defensive positioning changes up a bit. The second baseman is the lead guy in the double cut lining up to home plate, and the shortstop is his trail guy. 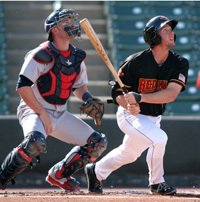 Looking for new hitting drills? 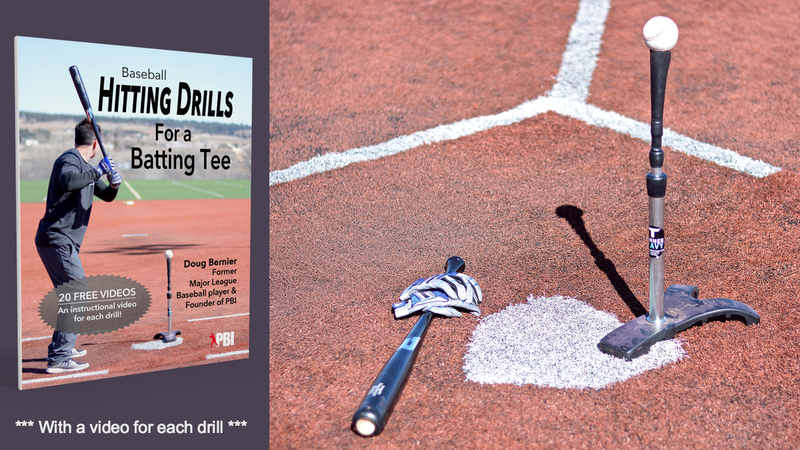 Pro Baseball Insider is proud to announce the release Baseball Hitting Drills for a Batting Tee: Practice Drills for Baseball, book 1. This book includes free videos, full color illustrations, bonus hitting tips, and more. Click here to learn more. Ball is hit down the right field line. Second baseman is the lead cut off man lining up to home plate. 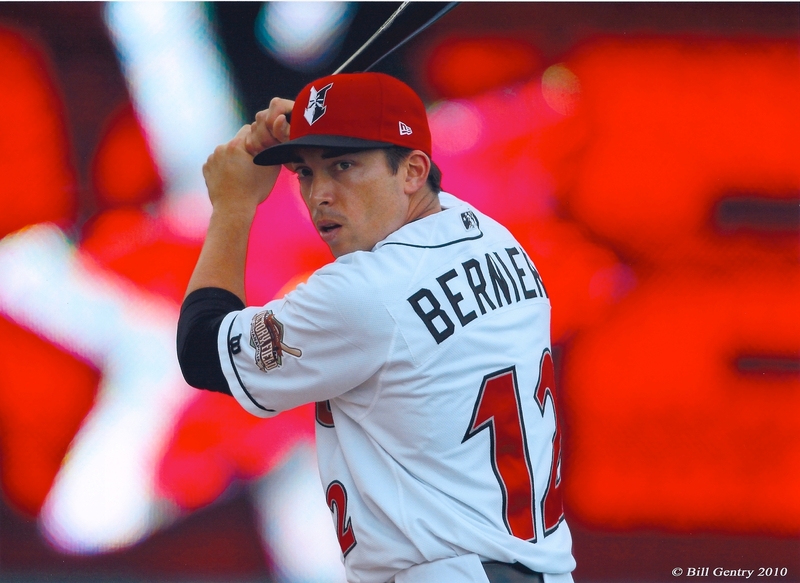 Stay in fair territory, and know your first baseman is behind you in case of a bad throw from the outfielder. When the batter hits a double to the wall with no runners on, then the relay is lined up to 3rd Base. This diagram is shows the double cut for a ball hit down the left field line with NO ONE on base. 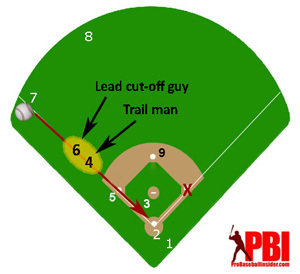 The throw will line up to 3rd base, with the shortstop as the lead cut-off man and the 2nd baseman as the trail guy. This diagram shows the double cut for a ball that is hit past the outfielders through the left center gap. Since there is no one on, the throw is to 3rd. The short stop is the lead cut-off guy, and the second baseman is the trail man. First baseman covers 2nd base. The pitcher backs up at third base. For balls hit in the right center gap, the second baseman is the lead guy in the doublecut and the short stop is the trailing cut-off guy. Again, with no baserunner, the play is at third base. The 1st baseman covers 2nd. The pitcher and left fielder back up the third baseman, in case the throw is off or he misses it. This diagram illustrates positioning for when the hitter gets a ball down the right field line. The second baseman is the lead guy in the doublecut lining up to third base. The 1st baseman is the trail guy. The short stop will be covering second base, and the left fielder should back up the throw behind third base. If there is a runner on third and the ball is hit to left field where does the first baseman go? If it is a fly ball, the first baseman stays at first. The third baseman lines up on the infield grass directly between the LF and catcher in case of the need for a cutoff. The SS covers 3rd base in the event of a rundown. This is good stuff, but I have to pick on your semantics. You’re using “cutoff” and “relay” completely interchangeably and they’re not exactly the same thing. A cutoff man can also act as a relay, but a relay man is not a cutoff. I appreciate the response and I guess I am being picky but if the first baseman is not trailing the runner to 2B with a man on 1st then why in diagram 3A runner on 1st base is he standing at 2B which looks like he is trailing the runner? I just want to make sure I am getting it right as we have been going over this with our team and don’t want to teach them the wrong thing. Appreciate your website and all the information by the way. Thanks for noticing the first baseman’s positioning in figure 3A. The positioning in these diagrams can be adjusted mildly depending on the team but these are the most common. I did ask my friend who plays first base for the Minnesota Twins and he said that the first baseman is the cut off man between third base and home plate. The right fielder would have to come in and cover 2nd base. Thanks for catching this mistake. I was wondering if when I wrote the diagram if one of the teams I was on actually did it this way or if I just made a mistake. Anyway thanks for catching it and I will be changing the diagram as soon as possible. Why then in the Diagram 3C and 3B does the drawing have the first baseman in tandem cut instead of trailing runner to 2B. Thanks for your question. The “double cut” is when two infielders go out for the cut off and the trailing infielder can catch an errant throw from an outfielder that the first cut off man can’t field. The first baseman in these diagrams is in his normal cut off position. He wouldn’t be trailing the runner to second base because with a runner on first base there is a potential play at home plate. He only trails the runner to second base when there are no runners on base, a runner on second, or third base. If there is a runner on first he is now a cut off man to home plate. 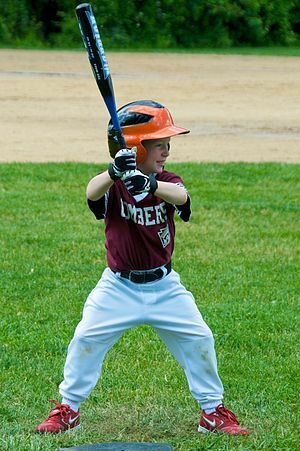 The first basemen’s job is to see the throw coming in and if there is a play at home let it go, if not, cut it and see if you can get the runner trying to stretch his double into a triple. The runner at 2nd may just stay at second because he knows the 1st baseman is there to throw him out if he tries to go to third base. Even though this is a double cut situation the first baseman is not directly involved in the “double cut”. I hope this clarifies the diagram. Thanks for your question. Thanks, Doug. I was wondering if you’ve seen any other variations of a double cut system that coaches use to fit the players they have on the infield? Also, I think it’s interesting how often you have the first baseman involved as the trail guy. Any special reason for this? Thanks for the question. I have seen other variations of double cuts but this is by far the most used. 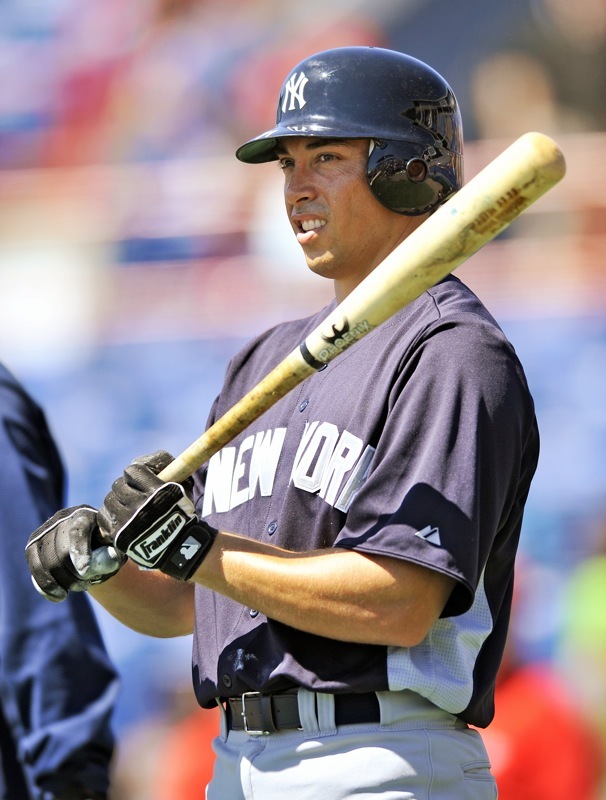 The first baseman is only used in double cuts on balls hit down the right field line. This is the case because it can be a long run for the shortstop to get into that position as well as have your first baseman run to where 2nd base is in front of him but is also a cut off man to third base. A variation I have seen is where only the shortstop and second baseman go out for every relay throw. I understand they catch and throw better than first baseman usually but you have to make sure they get to their spots. If these 2 guys are out of position a poor throw from your right fielder may allow the base runners to move up an extra base.